Microsoft kernel mode driver security update 3013455 released on February 10, 2015 has caused the quality of text to degrade or fonts to become corrupt on some systems. Systems impacted include Windows Server 2003 SP2, Server 2008 SP2 and Vista SP2. There is an independent report that XP may also be affected. Users with automatic updates enabled will likely already have this update. The solution is to uninstall the update from the control panel (add/remove programs). If you have enabled automatic updates, this update will still attempted to be installed, so if you have an afflicted system, you will have to start to control which updates are installed and avoid installing this one until/unless Microsoft finds a resolution (as of February 13 that was still not the case). One report indicated that only the Courier New font was impacted, but in fact, Arial and other fonts have also been impacted by this update. 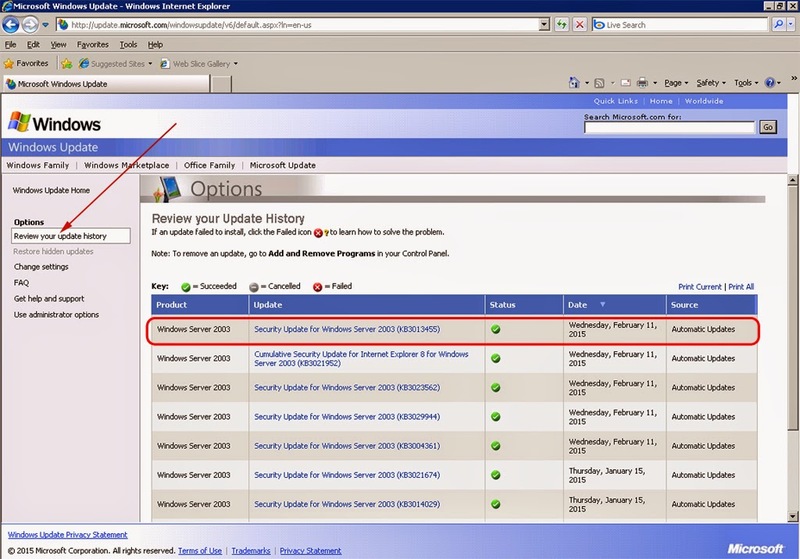 As of early morning on February 11, 2015, one of our users running Windows 2003 SP2 reported experiencing this issue. It did not make their system unusable, but it caused text to be significantly less readable (all characters lighter overall, each character with broken connecting lines and not evenly rounded). The same user had the problem recur 24 hours later because of having automatic updates enabled. In a Terminal Services environment, users logging into an afflicted server via remote desktop (RDP) may experience the problem, whereas directly connected user clients that either do not have the update or are running a non-impacted operating system may not experience the issue. Since 2004, we have provided a utility to assist end users in configuring the Btrieve 6.15 microkernel record manager engine in the context of providing support to end users of Advanced Accounting and TAS Professional originally released by Business Tools, Inc. Business Tools had an unlimited distribution license for the Btrieve 6.15 engine. Recently we have made additional enhancements to the utility which previously had not been changed since 2013 after periodic updates since its initial release by us. This update will be made available to our accounting software in a future release. We are now making the utility available for any third party use (since the configuration utility is not specific to any particular application). A screen shot of the latest version of our setup utility as of end of January 2015 is contained below. The latest version of the utility has been tested under XP Pro, Windows 7, Windows 8 and equivalent server versions, i.e. 2003 Server, 2008 Server and 2012 Server. The Btrieve 6.15 engine was published by Btrieve Technologies, Inc. (later Pervasive and now Actian Pervasive). It has not been updated nor supported by Pervasive since 1999. This engine however continues to be operational under all 32-bit and 64-bit operating systems released by Microsoft since that time. 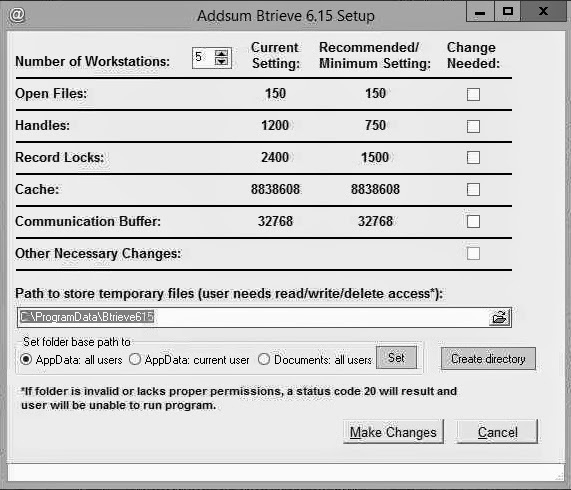 Btrieve 6.15 is a very compact workgroup engine that employs page locking (similar in terms of functionality to Microsoft Access, although it typically outperforms MS Access). Many software publishers have over the users distributed applications using the Btrieve record manager engine. Peachtree for many years for example included Btrieve 6.15 with their accounting software installations. The Btrieve 6.15 engine did not dynamically establish its settings as did the later versions renamed to be Pervasive. Therefore a utility that established those settings especially in a multi-user enviroment is needed. Business Tools provided a barebones tool named BTRVINSTL.EXE with the initial release of TAS Professional 6. This tool however did not establish all of the appropriate settings that were needed and that became apparent only after several years of end user support, and after further research on our part in migrating users from older versions of Business Tools software. This then led to the development of our own tool, BTRSETUP.EXE, the earliest version of which was released only to users we supported in 2004. Because the Btrieve 6.15 engine was designed to read values from HKEY_LOCAL_MACHINE, a local user needs more user rights than ordinarily might be desirable. This was less of a problem in earlier eras where security rights were somewhat less of an issue than they are today. With the newer security features added first with Vista and continuing with Windows 7 and Windows 8, some default and other settings that were provided by the original publisher of the Btrieve 6.15 engine are now in conflict and will even prevent the software from loading. (In that regard, see also our related blog post entitled Pervasive/Btrieve status (error) code 20). Our utility as now also recently updated can help prevent or solve some of those types of problems. More technical information is contained on the btr615setup.html page referenced above.